Fred Lawley’s role as designer and specifier was no sinecure but based on a formal education and sound apprenticeship also as a builder. 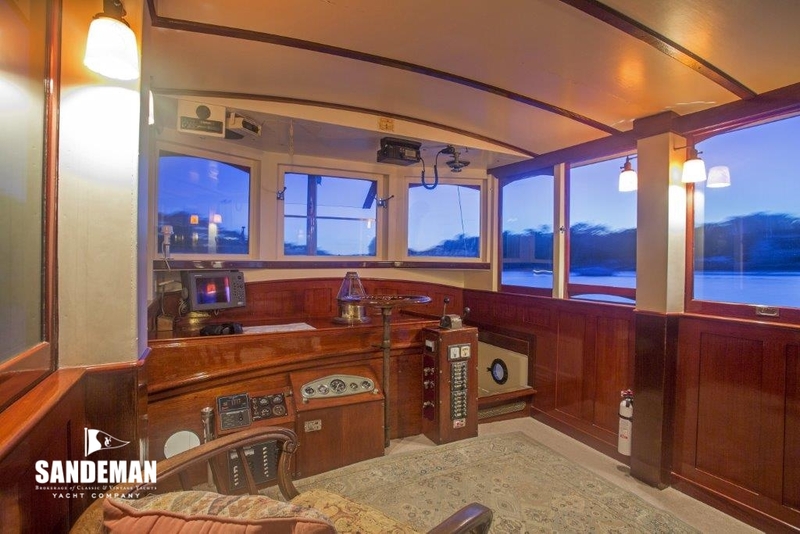 His yachts are noted for combining his thorough understanding of modern practice with careful attention to the detail of materials and sound methods of construction. 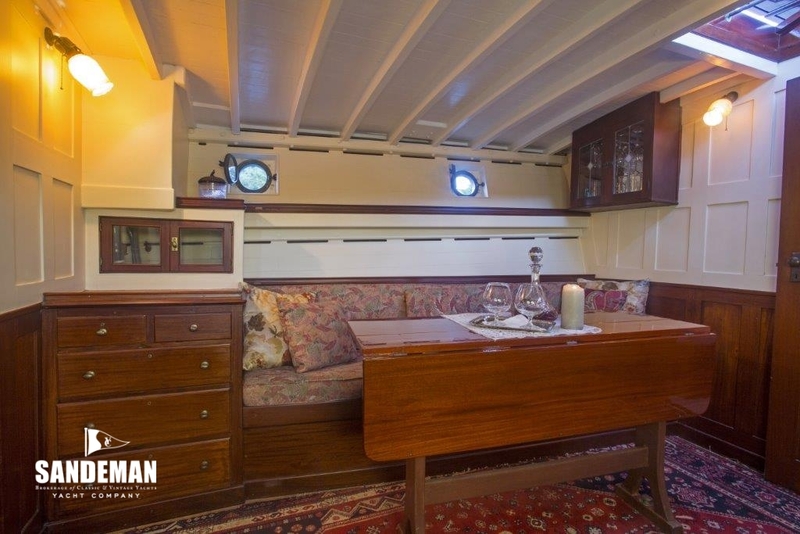 Although few of his sailing yachts achieved racing success, they were much admired for their beauty of line, excellence of finish, sea going qualities and comfort. 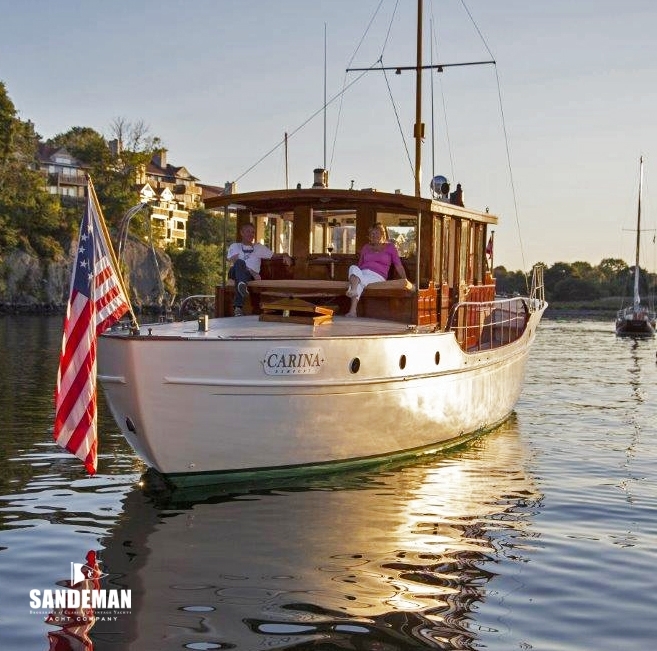 CARINA, formerly OLD GLORY, is one such lovely wooden motor yacht with beautiful lines culminating in a canoe transom with a graceful sweep. 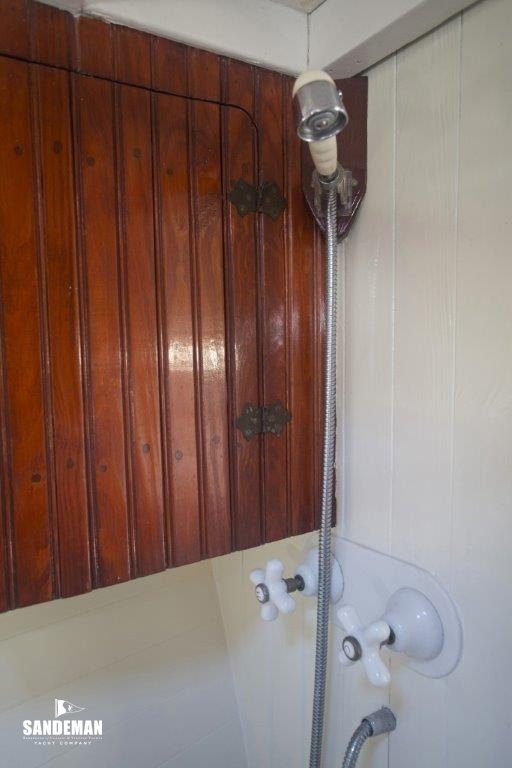 The interior is simple, largely original, with elegant touches and fixtures. 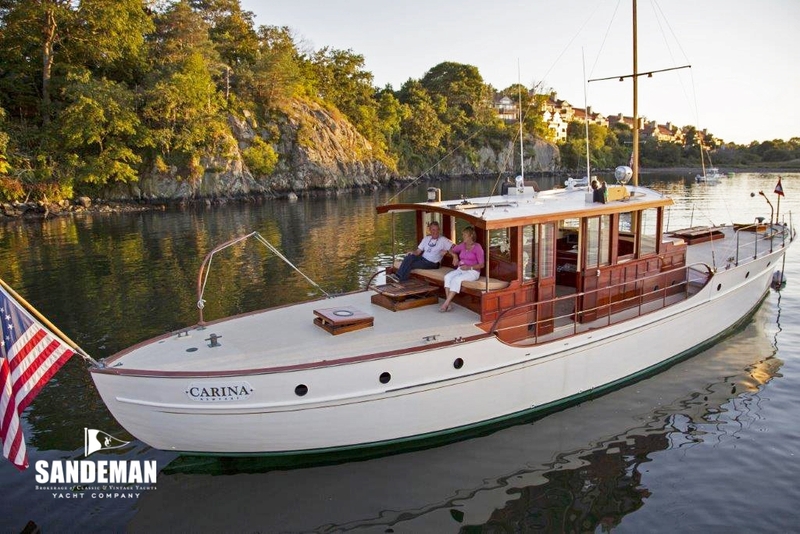 Under the ownership of her current hands-on custodian - one of the most experienced and respected yacht restorers of the classic yacht revival era - CARINA has enjoyed significant upgrading in recent years, raising the bar - both structurally and cosmetically - to her original glory. 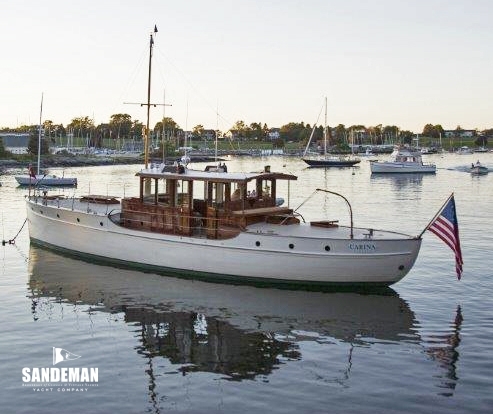 Designed by Fred Lawley This yacht was built – without the present wheelhouse in 1918 by the famous family boat yard business founded by his grandfather George - by then in Dorchester, Massachussetts, for one LH Spaulding. 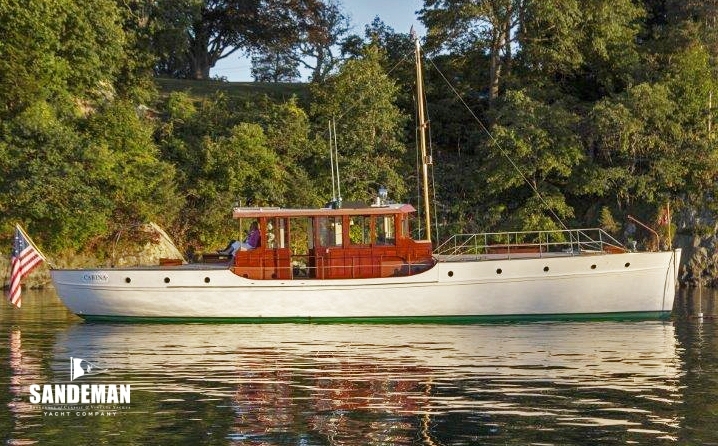 In 1923 she was sold to G.B Kimball, under whose ownership Nevins designed and built the current wheelhouse. She was sold on to Allan Hirsch 1925, Henry W Lloyd in 1926, and Robert N Bavier in 1930. 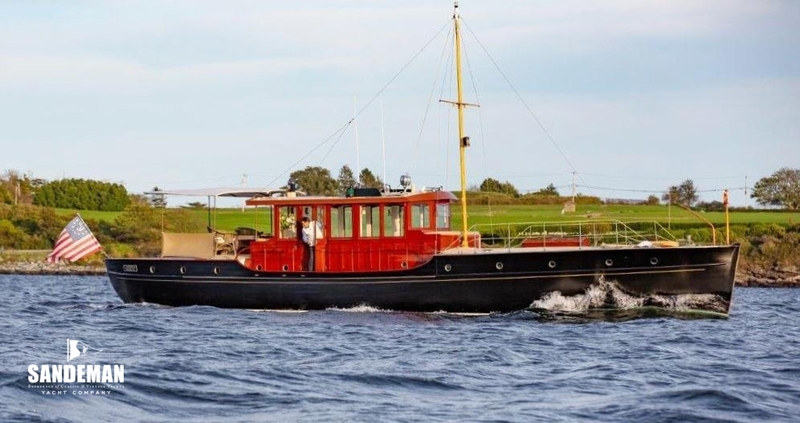 More happily after that flurry of ownerships, she was bought in 1939 by George P Bonell, one of the founders of the Cruising Club of America. Under his ownership for 40 plus years she ventured to Nova Scotia, twice to Greenland and south to Bermuda then to the Windward and Leeward Islands. When not on away trips, she apparently spent most of her time between New York, Nantucket and Boston. 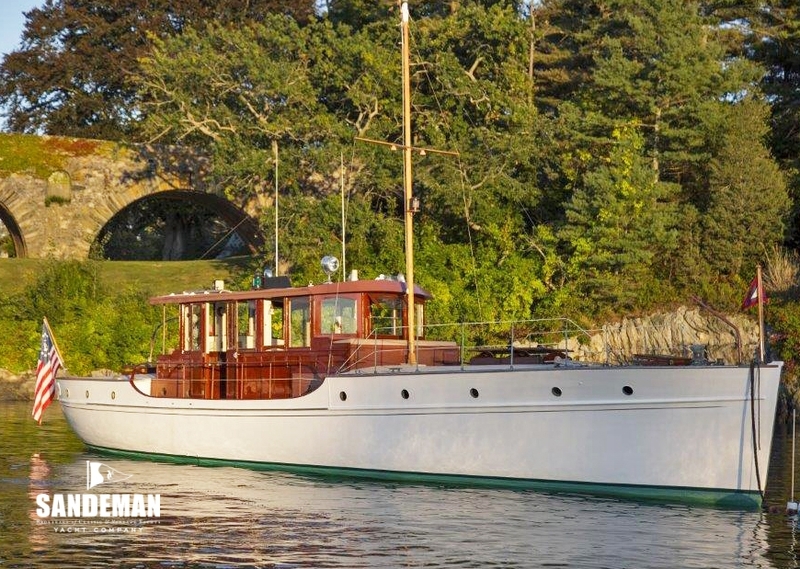 In 1980 she was sold to Edgar B Caffrey and was Chesapeake Bay based, then sold on to William R Skinner in 1991, who raised a family aboard in the Newport to Boston area. 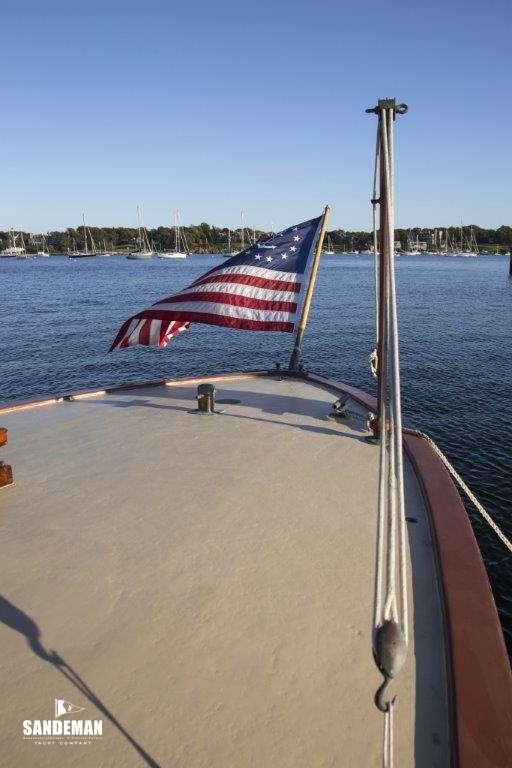 From the 1920s she was reportedly called OLD GLORY. Her present owner changed it to CARINA on buying her in 2006. 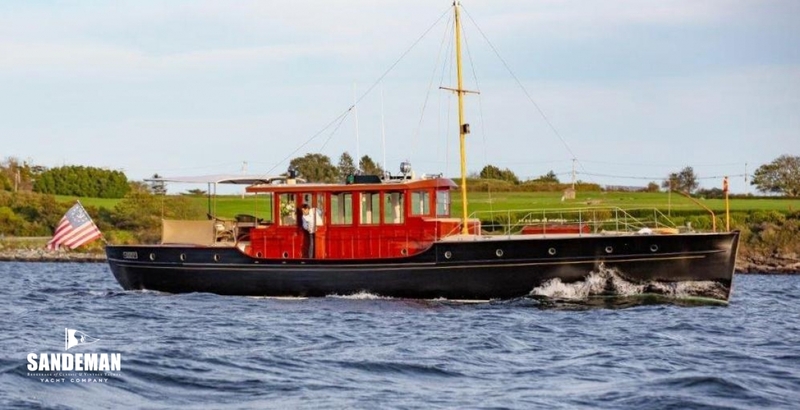 Some 75 % of her structure and planking is original and her interior has been substantially retained save for making both heads bigger with some nice cabinetry / bulkhead rework very sympathetically and without detriment to her character The main mast is now deck stepped and shorter than original, all deck hatches and the windlass / hardware accord with the 1918 drawings. 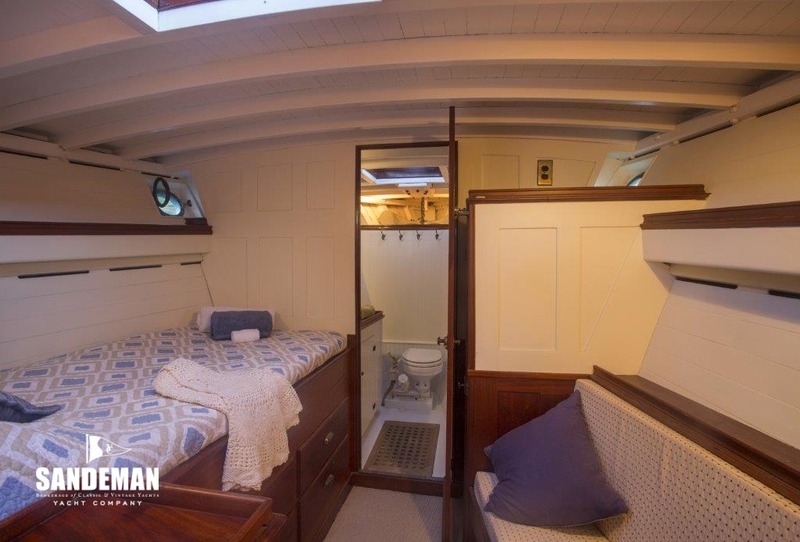 Hull construction is double 1 1/8th inch fir outer planking and back fastened 3/8th inch inner cedar planking to steam bent 2 x 2 inch white oak frames to circa 13 inch centres. 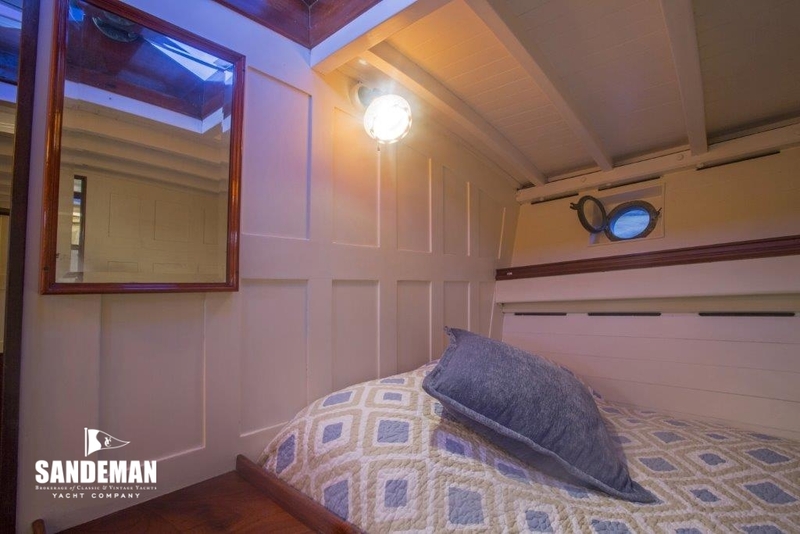 The garboard, broad strake and two planks above are single plank fir; 1 ½ inch. Every fourth frame is a sawn double futtock, bolted. 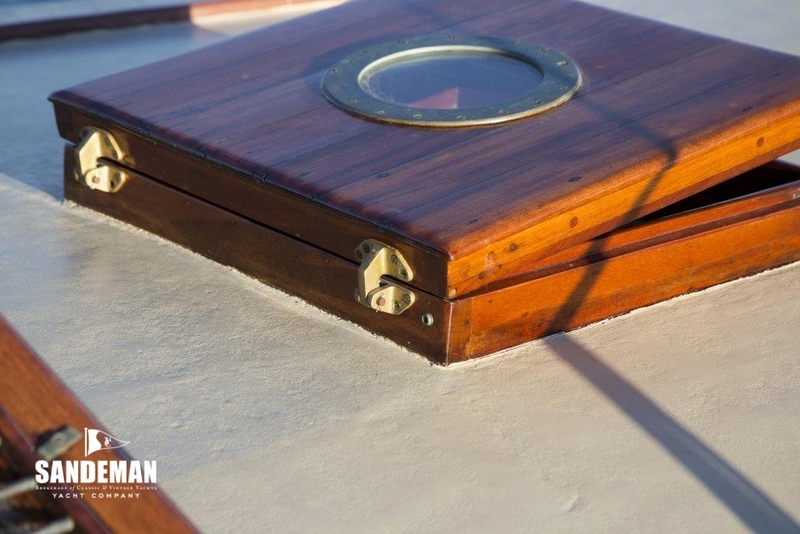 Plank to frame fastening is by copper rivet and bronze # 14 wood screws, floor timber and double futtock bolting with 5/16th inch bronze carriage bolts. Cap rail covering boards are c 6 inch wide mahogany and are painted in a mahogany color. 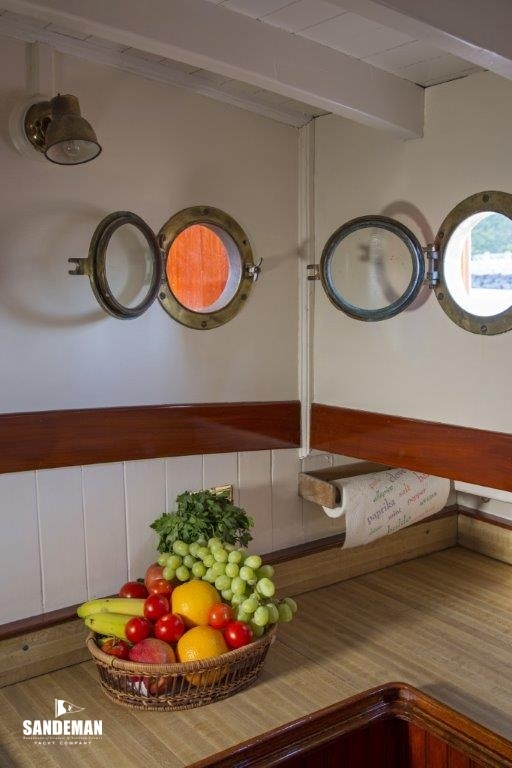 - Fore deck seating houses propane bottles, which are well vented. 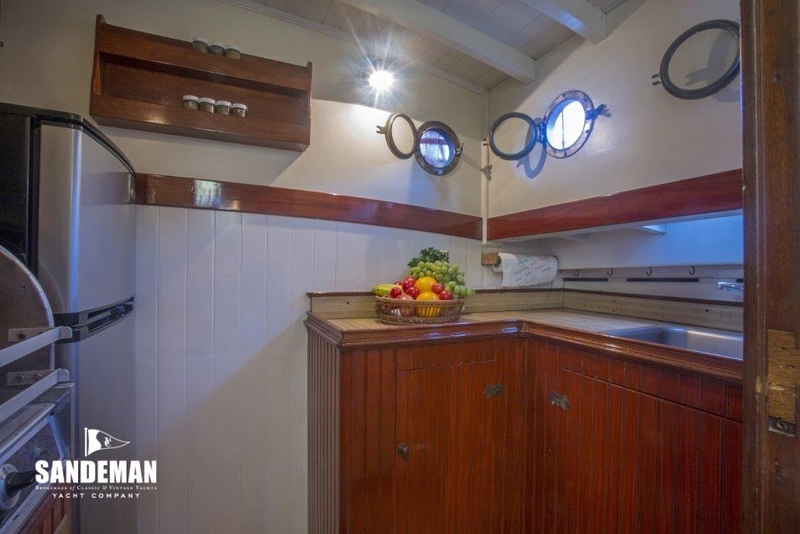 The deck house saloon offering clear views all round, is beautifully appointed with the helm and traditional brass compass amidships and a working navigation table top area to port. 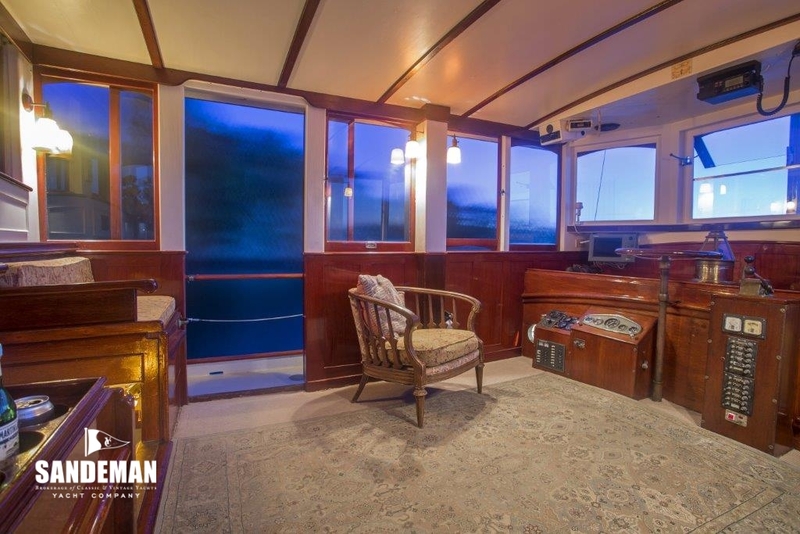 There is a mahogany wet bar in the starboard aft corner and bench seating to port with Tiffany stained glass sconces all around. 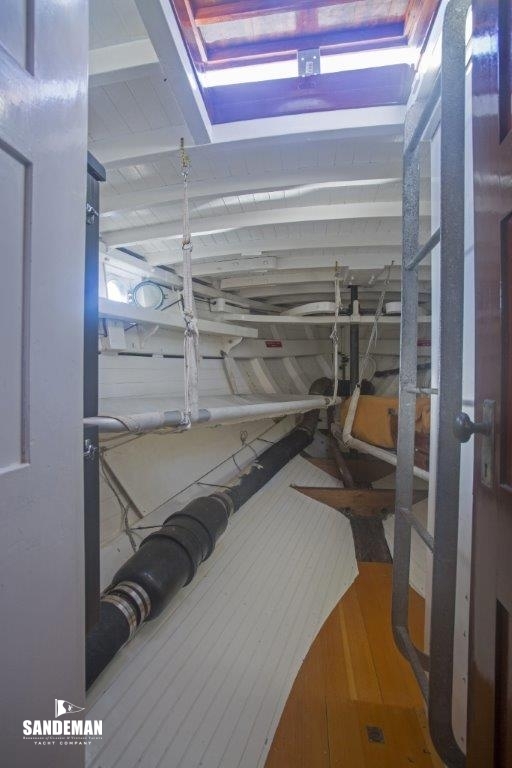 Down companionway steps forward to starboard is the working galley. 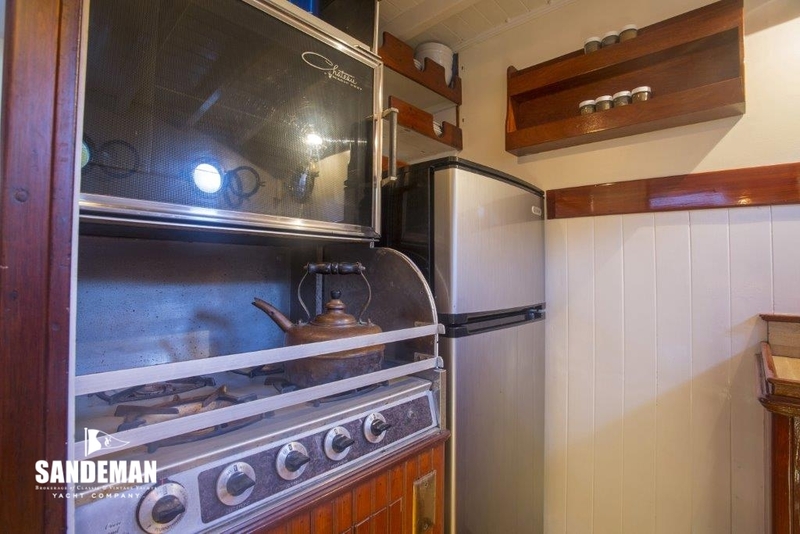 This has a custom built 4 burner propane hob with a Magic Chef oven, stand up fridge and single stainless steel basin with hot and cold running water. 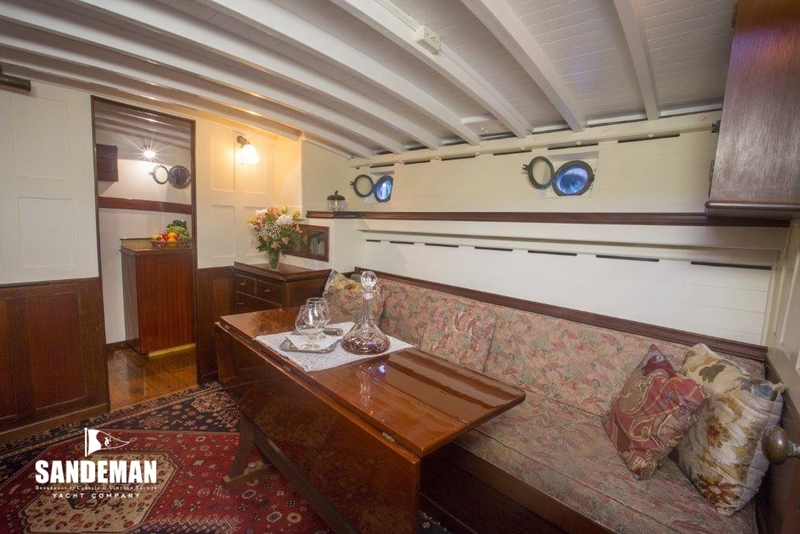 Forward is the very large main saloon with settees both sides and a table midway. 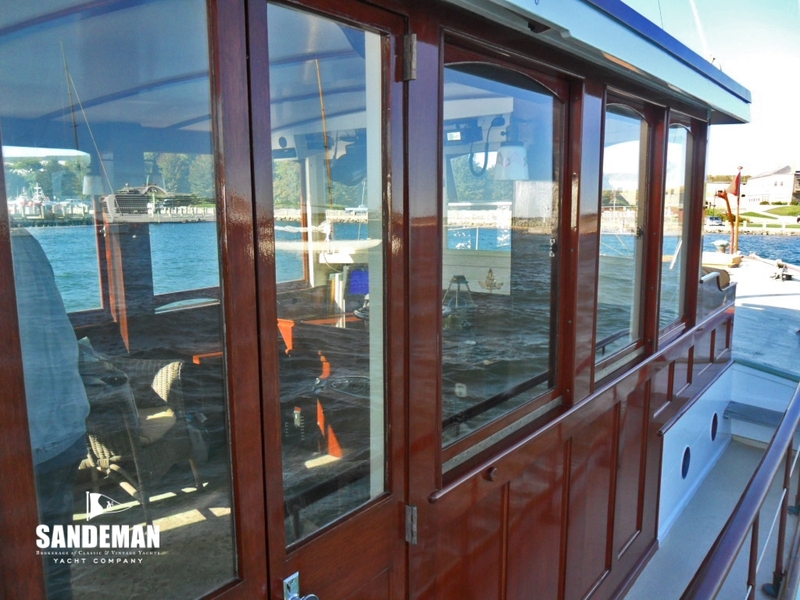 The bulkhead walls are raised mahogany panels, top half painted and bottom half varnished with a chair rail all round. There are 3 varnished cabinets and numerous Tiffany wall sconces. 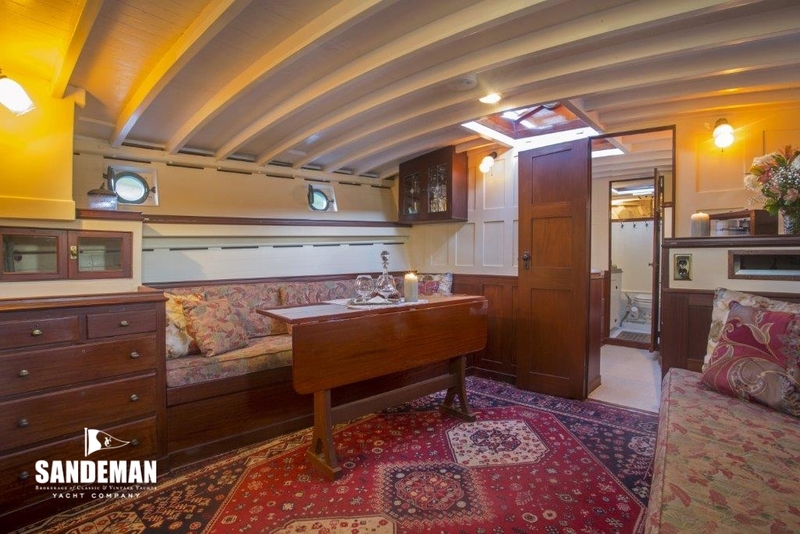 Forward is the owner’s state room with a large berth to port and mahogany drawers under. 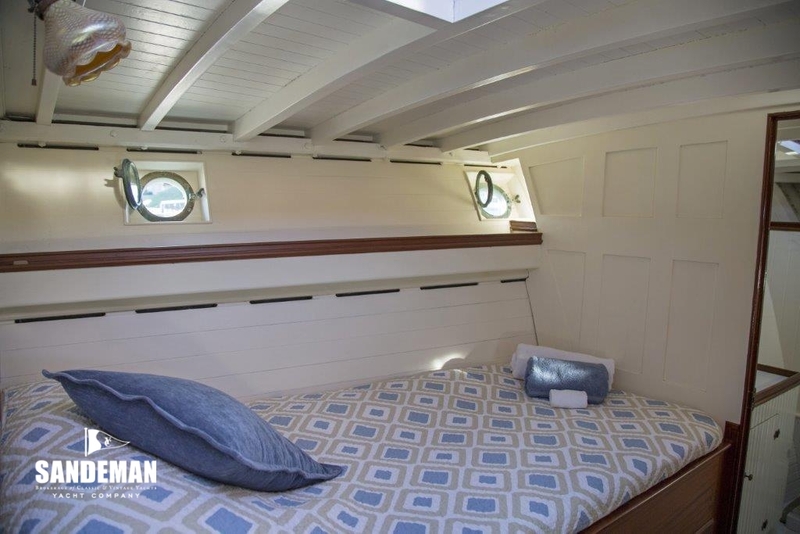 To starboard is a long cushioned seat with storage below. There is also a mahogany dresser and mirror set in. 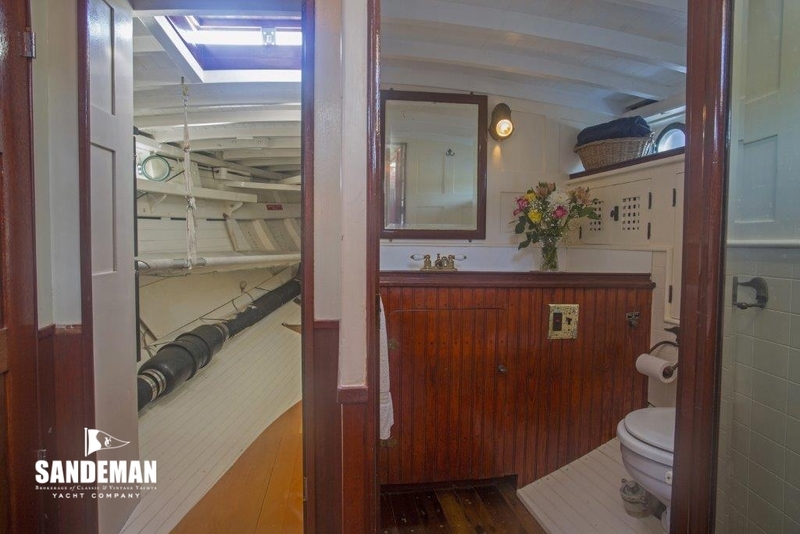 In the bow is the forward head appointed with brass fixtures, brightly varnished trim pieces with basin and H&C running water, Raratan electric WC, mirror and shower with a teak grate on the floor. 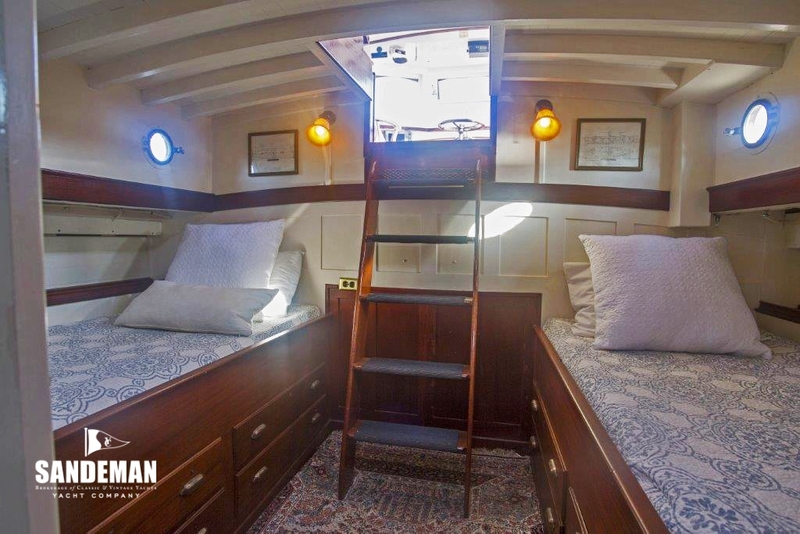 Coming aft through the deckhouse and down companionway steps amidships the aft state room has two large berths on both sides with varnished fascia and drawers for storage below. Good light is provided by butterfly hatch and ports. Bulkheads are varnished / painted. 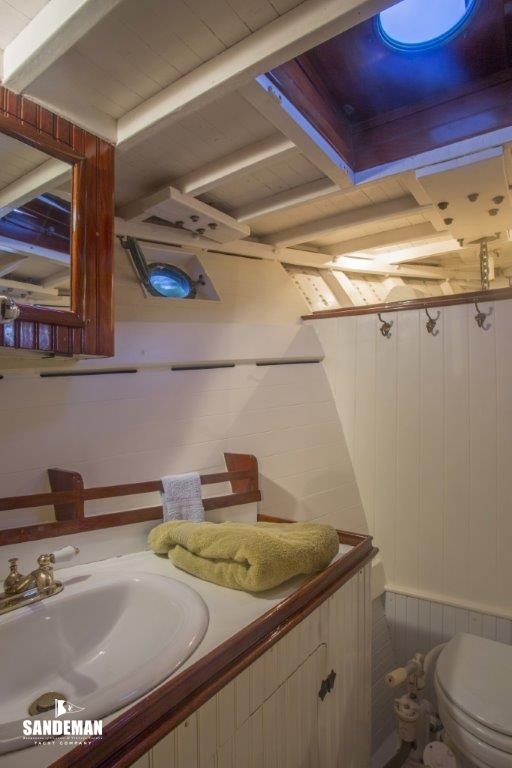 Aft of the state room to port is a large head appointed with brass fixtures, brightly varnished trim pieces with Raratan electric WC, basin with H&C, painted panelling, a varnished vanity, good ventilation and light also from hatch and ports. 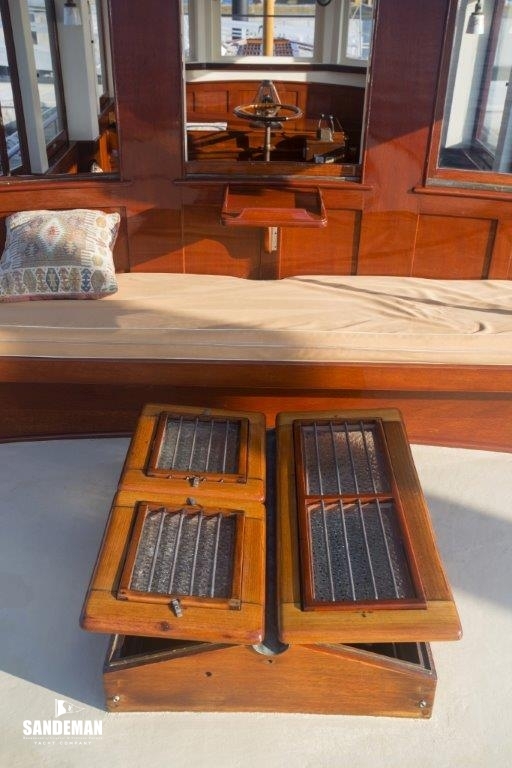 The aft steering gear / utility compartment is large with a lot of storage space and two pipe cots. There is also a 120 V fridge / freezer. 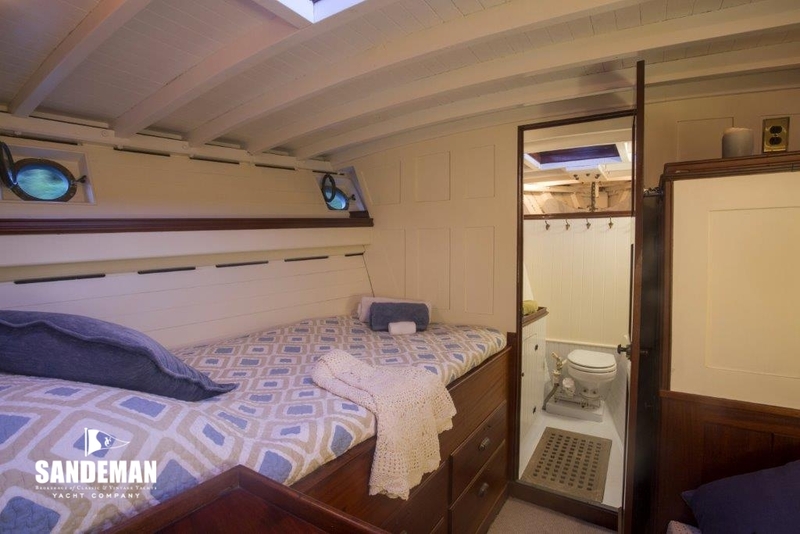 - The sound insulated engine room accessed through the pilot house saloon sole is smartly laid out and very serviceable with good access to all machinery. - Dual Racor fuel filters, Plumbed into the fuel manifold. - External sea strainer on raw water thru hull inlet to clear glass Graco strainer by sea valve. - New 80 A alternator. - 2 x 10 lb aluminum Propane tanks. 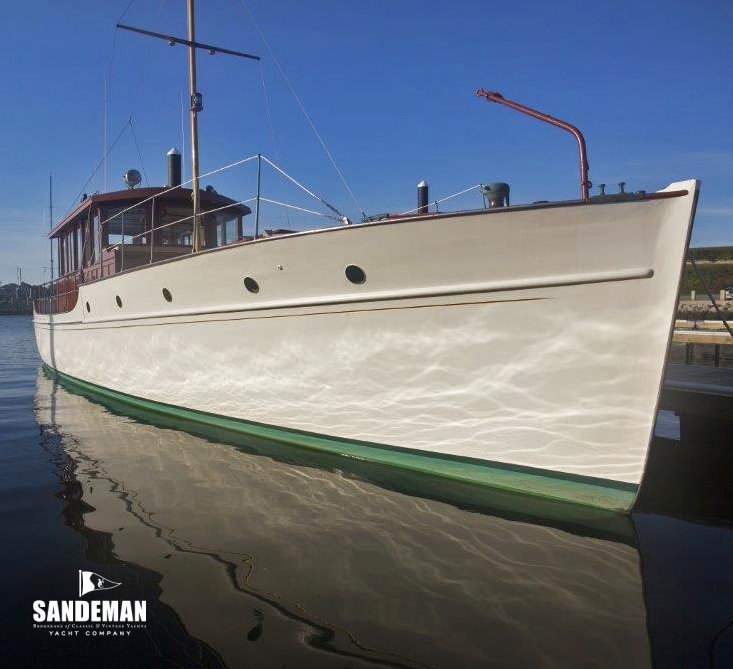 The exterior hull has had 40% of the hull sides reefed out and splined with fir. 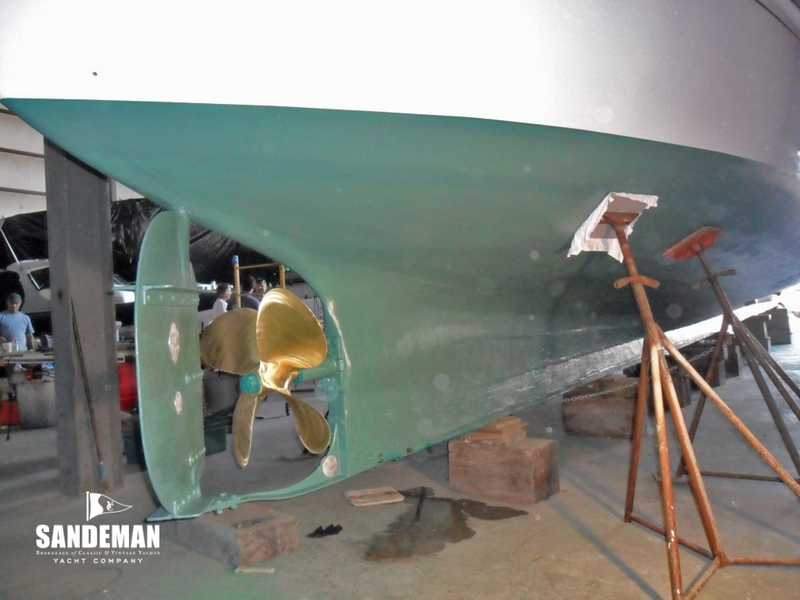 After the splining, the hull sides were planed fair and then board sanded fair, primed and painted, sanded down spot primed and completely repainted in a semi-gloss white finish. 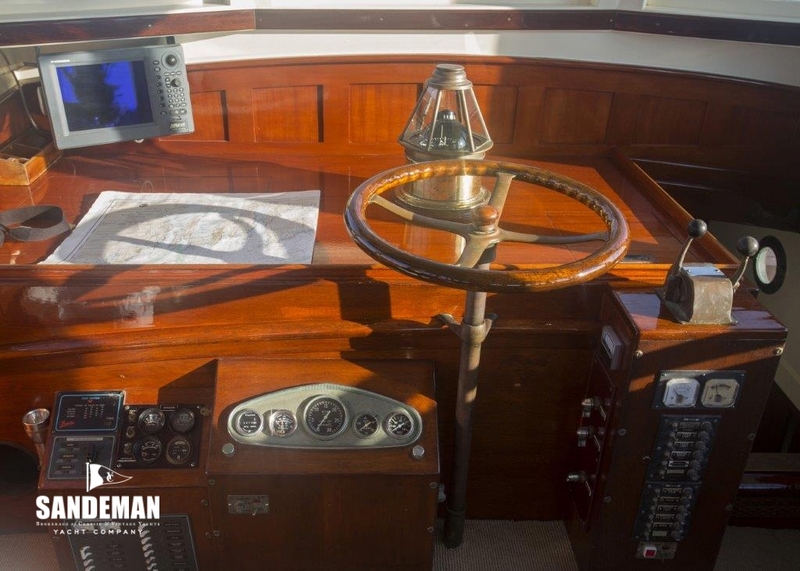 New white oak floor timbers have been installed towards the aft end of the boat in the steering gear compartment, stiffening an area quite stressed with propeller and rudder action. 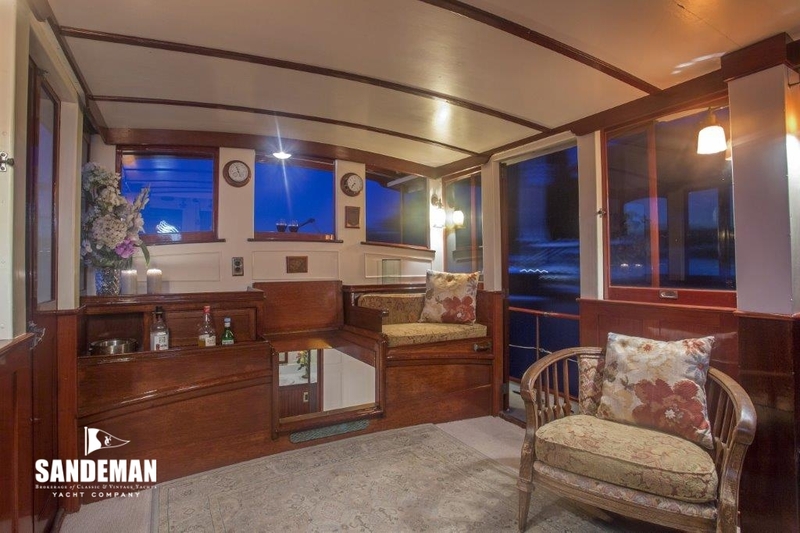 Refit of the middle section of the vessel, from the owner’s cabin forward to the galley mid aft, in the form of furniture and water tank removal, installation of new frames new floor timbers and all associated fasteners was undertaken in the mid 90s. 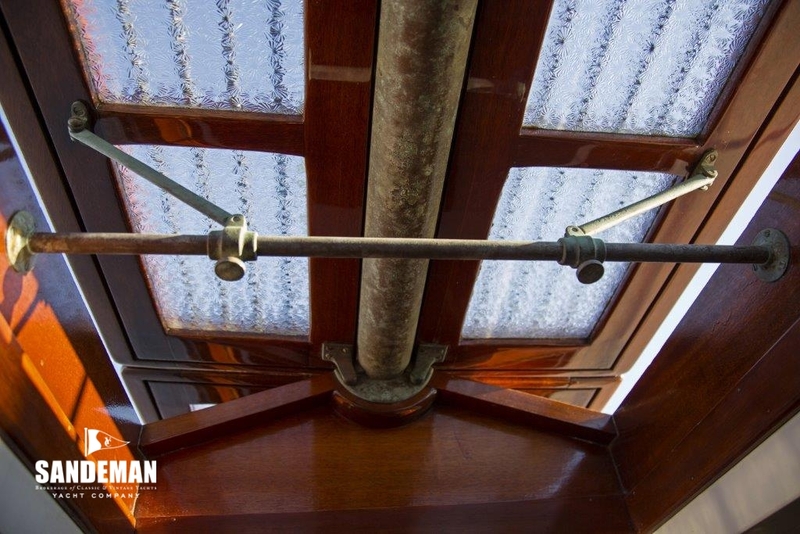 In 2006, in the aft cabin / lazarette, a dozen port and starboard steamed and sawn oak frames were removed and replaced from the horn timber / keel to waterline using 12 to 1 glued scarves and bronze wood screw fastened. The stem was recently stripped to bare wood checked out, reprimed and repainted. 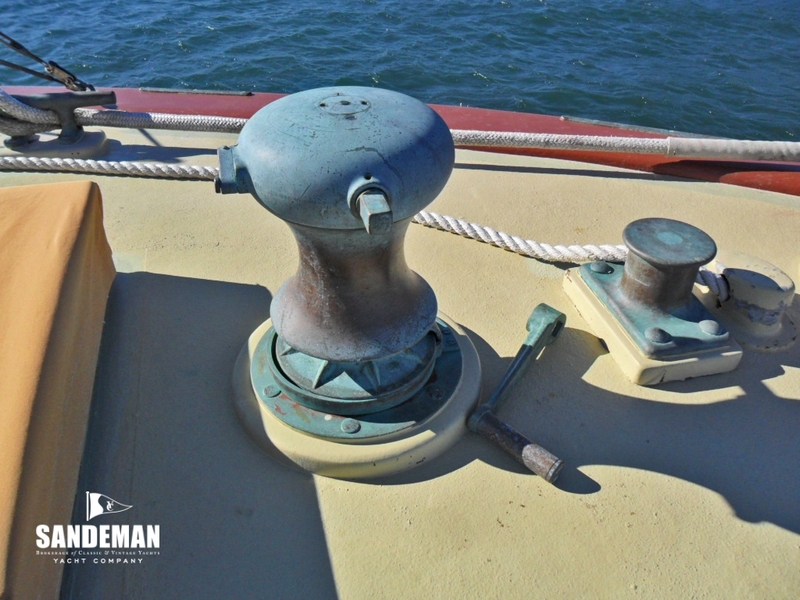 From the stem down the bow to the flat of the keel is a 1’ x ½” half round bronze striker bar, for good protection.